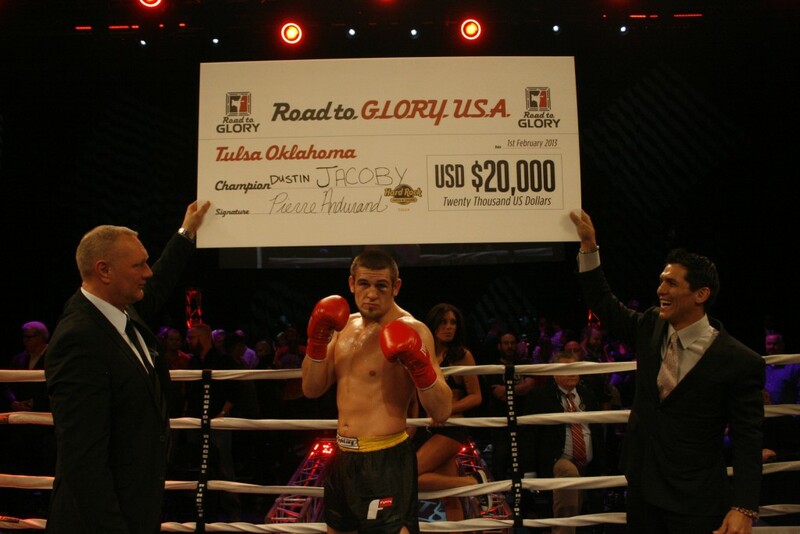 TULSA, Okla. (Feb. 2, 2013) – After accepting the opportunity to fight just one day before the event, 24-year-old Dustin Jacoby (9-3) of Arenzville, Illin. 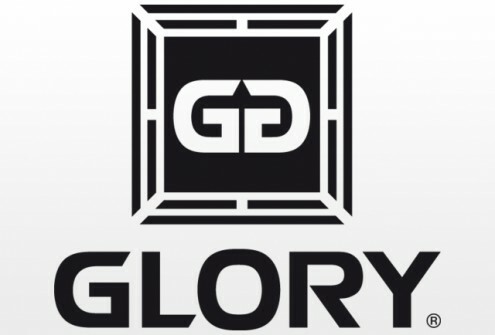 rose to the occasion, defeating three consecutive opponents, all by way of (T)KO, in one night to capture the inaugural ROAD TO GLORY USA light heavyweight (209 pounds/95 kilograms) tournament championship at Hard Rock Hotel & Casino Tulsa on Friday, Feb. 1. Jacoby was called on to compete just 4! 8 hours in advance of the event and drove to Tulsa from Arenzville, after Manuel Quezada, one of the original eight entrants, suddenly withdrew from the tournament for unknown reasons. In the tournament’s quarterfinal stage, reigning ISKA world champion Randy “Boom Boom” Blake (25-2, 17 KOs) of Tulsa, a local superstar and favorite to win the tournament, battered the left leg of Jacoby and hammered Jacoby with punching combinations for over two rounds. In the third stanza, though, Jacoby suddenly countered with a flurry that put Blake down and forced the referee to intervene and stop the bout at the 1:43 mark of the final scheduled round. In the semifinal stage, Jacoby faced off with Roy “Wreckin’ Ball” Boughton (9-4, 8 KOs), who had defeated Daniel “Sandman” Brison (9-3, 6 KOs) by way of unanimous decision to advance past the quarterfinal stage. After eating a right h! and, Jacoby responded with a series of stiff jabs that snapped Boughton’s head back. Jacoby exploded with a knee strike to the head that sent Boughton to the canvas. Boughton beat the referee’s 10 count, but was put down for the second time with a Jacoby left hook to the body. 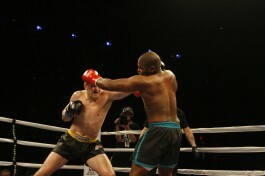 The tournament’s “two knockdown rule” took effect, giving Jacoby the TKO victory at the 2:47 mark of the second round. With a considerable amount of momentum behind him, Jacoby came out the aggressor in the tournament’s championship round, against previously undefeated Brian Collette (19-1, 16 KOs), who had scored a second round (:14) KO on Jeremy Freitag in the quarterfinal round of the event and a first round (1:29) TKO on Kyle Martin in the semifinal stage of the tournament. Jacoby began connecting with a series of stiff jabs and a left hook to Collette’s body. With ! less than 10 seconds remaining in the opening round of action, Jacoby unloaded a barrage that put Collette on the mat face first, unable to recover. 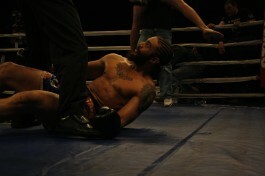 Jacoby was declared the victor of the bout by way of first round (3:00) KO. This entry was posted in Features, News & Results and tagged Brian Collette, featured, Jacoby Boughton, kickboxing, ROAD TO GLORY USA. Bookmark the permalink.